It has been over a week and I still do not have the update for my iPad or iPhone. I am level 66 and I do not have the update. I have tried all the suggestions. Does anyone else have the same problem? I have contacted them, but only received a form letter back. Have you updated your Apple Store? @glw4444 there was no Update one week ago. Sorry11.2.6. The update was to increase council to level 23. @glw4444 11.2.6 is the version of Apple iOS on your iPad, not the version of walking dead. I’ll take a screen shot and show you what he’s asking.. gimme a second. 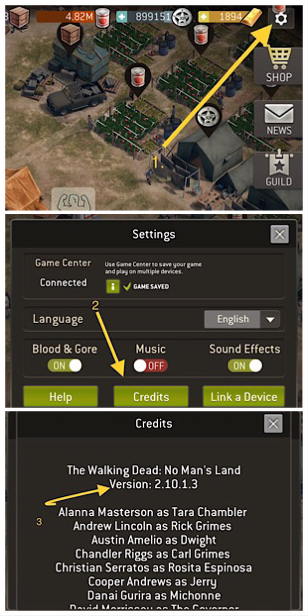 @glw4444 while you are in the game click settings (gear icon), credits.it should tell you what version of the game you have, the latest is 2.10.1.3. If you have that you are good to go. I don't use IOS but you need to go to the appstore and check what version of the game you have. What version is shown when you check with these 3 steps? 2.10.1.3 is my version. My council is level 22. My supplies are maxed at 17.9. I need 20 million to increase council. I can not increase my supplies, so I cannot increase the council. My game keeps saying I need to update my supplies. @glw4444 upgrade your storage first. After that you can hold 20 Mio supplies. Thank you. I am able to increase my supplies storage, finally. I have tried everyday. Several times a day. @David_H79 want to keep that image somewhere in case it’s needed again? I won’t mind.